They finished recording the tracks last month and they are currently being mixed ready for a hoped for release in Spring 2016. 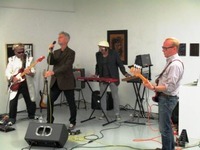 The album has been produced and is being mixed by none other than Martyn Young of Colourbox and MARRS fame, who also plays additional keyboards on the album. This will be the first release Martyn has been involved in since MARRS Pump Up The Volume in 1987. Martyn is an old friend of the band and mixed both the single version of 'Someone's Calling' and remixed 'Life In The Gladhouse'. Though at the moment they have not signed up with a label for the release the band will imminently be setting up a 'Pledge' page to gain support funding for the release. In addition since finishing recording the album the band have continued writing and have three more songs in development which they hope to take on the road next year. In Robbie's words 'They were written like we used to in the early days, jamming as a band and has Mick back doing his thundering basslines. Martyn was really enthusiastic when he heard them.' So with one album already recorded it looks like the guys are already well on their way preparing tracks for the one after that. As mentioned I met up with the band last week. 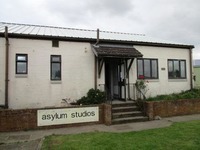 It was an amazing event as I got to meet the guys at Asylum Studios. It also has an art exhibition room and the band played a once only performance of the (get this!) the This Mortal Coil version of Sixteen Days/Gathering Dust plus there own rendition of the This Mortal Coil cover of 'Not Me' (which had Robbie on vocals). To do this they had Gary on guitar, Mick on bass, Robbie on vocals (instead of Liz Fraser) and keyboards by Steve PLUS drum machine and recorded keyboards by Martyn Young. The performance was videoed and will soon be posted up by the band. 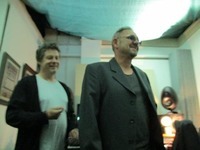 Below are photo's of Steve with Martyn Young in the production studio, the band performance and Asylum studios.